Mark 1:14-20 Now after John was arrested, Jesus came to Galilee, proclaiming the good news of God, 15 and saying, “The time is fulfilled, and the kingdom of God has come near; repent, and believe in the good news.” 16 As Jesus passed along the Sea of Galilee, he saw Simon and his brother Andrew casting a net into the sea—for they were fishermen. 17 And Jesus said to them, “Follow me and I will make you fish for people.” 18 And immediately they left their nets and followed him. 19 As he went a little farther, he saw James son of Zebedee and his brother John, who were in their boat mending the nets. 20 Immediately he called them; and they left their father Zebedee in the boat with the hired men, and followed him. Living with a couple of teenagers, there are these things that happen in my home loosely called “homework parties.” Sometimes they’re more party than homework although homework seems to get done somehow. They happen on various days throughout the week around the dinner table. There’s the requisite books, pencils, calculators that I’ve come to think of as homework camo. There’s typically food involved – sometimes dinner, sometimes snacks, but always food. Often I’m in the kitchen/family room either reading, writing, or watching TV. An occasional teenager will migrate through on a quest for more food and we’ll have a bit of a chat. Since some of these teenagers are high school seniors, the chats include tidbits about what’s next after high school. The answers vary. Some will continue onto college, some will find work, some aren’t sure yet. What seems to be consistent, though, is this growing sense of urgency to figure it out. That makes sense. We’ve cruised through the beginning of the New Year and graduation is only part of a semester away. Sometimes, if one of the kids seems to be lingering and the chat keeps going, I’ll share a bit of my own first try at the post-high school life. I had just turned 17 that August before heading out the door to college. The short of it is that it didn’t go well. Friends were far more interesting than physics. In June, at the end of the school year, I was still 17. My parents came out to my college town, took me to lunch, and told me that the last 9 months had been “a poor return on their investment.” I was invited home where the offer was to get a job and hit the books at the City College to finish my nursing degree there. At the time, I was devastated. Ten years later, I could see my culpability and had a vague appreciation that they had done what they thought was best. Now as a parent of a high-school senior, I have some sense of their frustration that led to the courage it took on their part to do what they did. When I tell this story to the teens who move in and out of my kitchen, it ends with something like this, “Remember, there are a lot of ways through this life.” Some ways are created by our choices and some ways we figure out as things happen to us out of the blue. Regardless, there are a lot of ways through this life. Today’s Bible story is triggered by a trauma. John the Baptist has just been arrested. Prior to his arrest, John was baptizing a lot of people, including Jesus. John’s arrest starts the action. John and Jesus are known to each other and also to the Galileans – Simon, Andrew, James, and John. Matt Skinner suggests that the four fishers had likely grown up around each other. They had probably heard John and Jesus teaching as well as simply known each other as locals. So the action that John’s arrest instigates is connected backwards into history and relationship even as it moves forward. And forward it does. Jesus walks by the sea, calling the fishers off of their boats. There’s no explanation in the text for it really. It’s the shortest persuasive street preaching outside of Jonah’s eight word sermon to the people of Ninevah. Too bad Jonah isn’t available for some preaching here with us today. For all intents and purposes, Jesus tells the fishers that the time is now and the kingdom of God is brushing by them – meaning, God is present. The fishers’ are immediately inspired to leave their nets and their boats and follow. They are one more example of the many ways through this life as a Jesus follower. Today at worship we are installing the newly elected and called members of our Congregational Council who help lead the congregation somewhat like a Board of Directors might. A few months ago, we installed the called members of our Transition Team. These people are collecting information from all of us in the congregation so that we might be able to describe Augustana as we are now, while trying to describe a future as we go through a call process for the next Senior Pastor. There is some attention to detail needed while leading a congregation or calling a new pastor. In the midst of those details, there are also things that require immediate action. The trick for Jesus followers is figuring out a direction through the many ways our life together could go while keeping the main thing, the main thing. The main thing being what Jesus calls “the good news of God”. Sometimes we also call it the “gospel”. It is the good news of God that sustains a lot of us as we figure out our way through this life. For some of us, this may mean simply muddling through today. There is something reassuring to me about the immediacy of Jesus-following along the lines of the Galilean fishers who likely started out with a different plan for their day that didn’t include leaving behind nets, boats, and father to follow Jesus. How many times have you started out your day, your week, or your year with a plan? You have a good, doable plan only to have it subverted by an entirely new thing that seems neither good nor doable? It didn’t make sense for the Galilean fishers to follow Jesus. Frankly, it may not make much sense for us either. There may be ways in which our plans are being challenged and destabilized – plans that are biting the dust either by our own fault, somebody else’s fault, or merely by happenstance. Jesus dares us to trust in God’s presence regardless, in the kingdom of God coming near no matter what else comes. Jesus calls us to follow regardless of our plans today or tomorrow. We can’t follow perfectly in this world. Not even those Galilean fishers can pull it off when the going gets tough around the cross. The time is now and the kingdom of God is brushing by you, meaning God IS present. That’s why the call to follow is connected to the good news of Jesus. We know now what the Galilean fishers did not know then, this does end well. Thanks be to God. Matt Skinner. Professor of New Testament at Luther Seminary in St. Paul, MN. 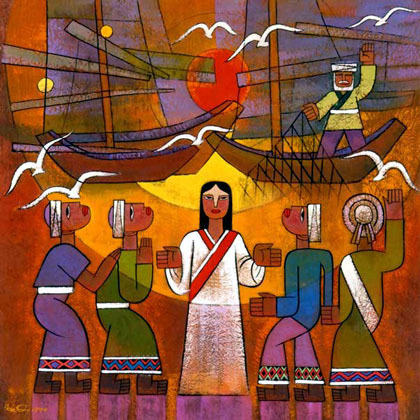 Mark 1:14-20, Sermon Brainwave on WorkingPreacher.org for Sunday, January 25, 2015. Again from Matt Skinner [see footnote 1]: Following Jesus is one of the main messages in the Gospel of Mark. In Mark, Jesus wants followers. In contrast with John’s gospel in which Jesus wants witnesses and in the Gospel of Matthew Jesus is after disciples.